History runs deep with the Indian Scout. Its heritage-inspired design, premium chrome finishes and modern performance make it stand out from the rest. ORIGINALITY COMES STANDARD: A name that goes back a century. An experience that lives up to the legacy. The Scout is built for those who know how to enjoy the ride. 100-HP V-TWIN ENGINE: Powered by a liquid-cooled, 69-cubic-inch, 100-horsepower V-Twin. Distinctive style, best-in-class performance, and amazing throttle response. AGILE HANDLING: A low seat height and a lightweight frame make for an easy, confident ride at every speed. PREMIUM SUSPENSION: A cartridge fork front suspension and Pirelli tires provide a sporty feel while absorbing any bumps the road may throw at you. A MODERN CLASSIC: The Scout blends timeless style with modern design to deliver an outstanding experience for any rider. HERITAGE-INSPIRED DESIGN: Inspired by the original 1920 Scout, with a headlight, handlebars, wheels and fleet-sided fenders that nod to its rich heritage. PREMIUM CHROME FINISHES: Premium chrome provides plenty of head-turning shine. GENUINE LEATHER SEAT: A comfortable seat designed to withstand the elements while maintaining its natural beauty. A HISTORY OF LOOKING FORWARD: The Scout brings an iconic design into the future with advanced technology. Because when you set the standard, there are no compromises. MODERN TECHNOLOGY: Electronic fuel injection for smooth power delivery, liquid cooling for optimal performance and a 6-speed transmission that can throw you back in every gear. STAY CHARGED: An integrated USB port keeps your devices in the green. SERIOUS STOPPING POWER: Superior stopping power with ABS standard on all color options. Front / Rear - Cast 16 x 3.5 in. 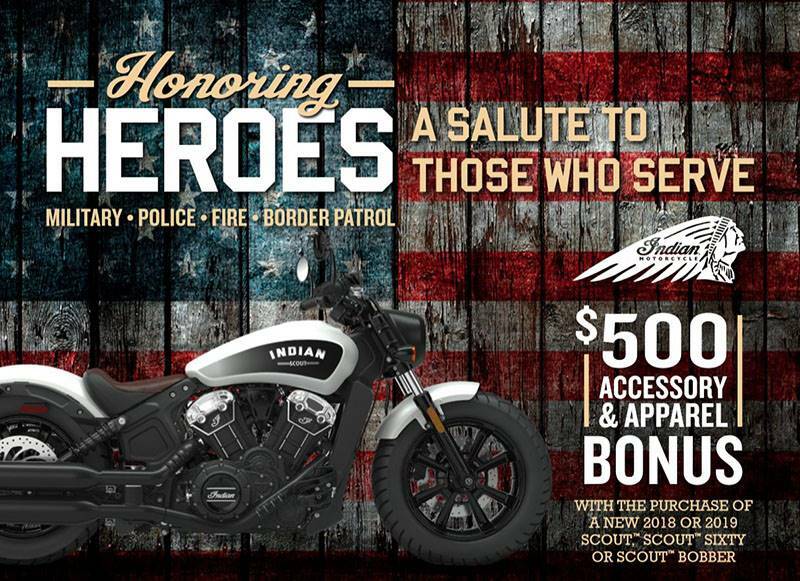 Honoring Heroes – A Salute to Those Who Serve! 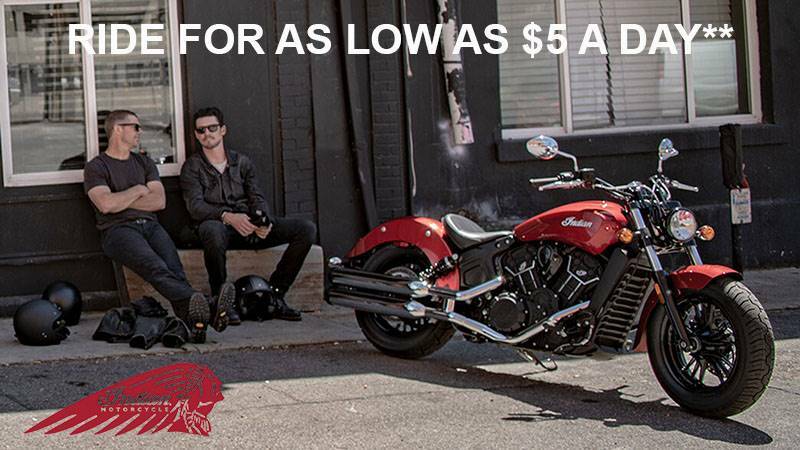 Indian® and Indian Motorcycle® are registered trademarks of Indian Motorcycle International LLC. Always wear a helmet, eye protection and protective clothing and obey the speed limit. Never ride under the influence of drugs or alcohol. 2745 Mall of Georgia Blvd N.E.